Defense Secretary Jim Mattis indicated this week that the U.S. will lift a suspension of joint military exercises with South Korea. This announcement, in addition to President Trump’s recent cancelation of his State Department’s visit to Pyongyang, goes against what Peace Science tells us about the importance of granting concessions and avoiding provocations during intense negotiations. Defense Secretary Jim Mattis indicated this week that the U.S. was lifting a suspension of joint military exercises with South Korea. 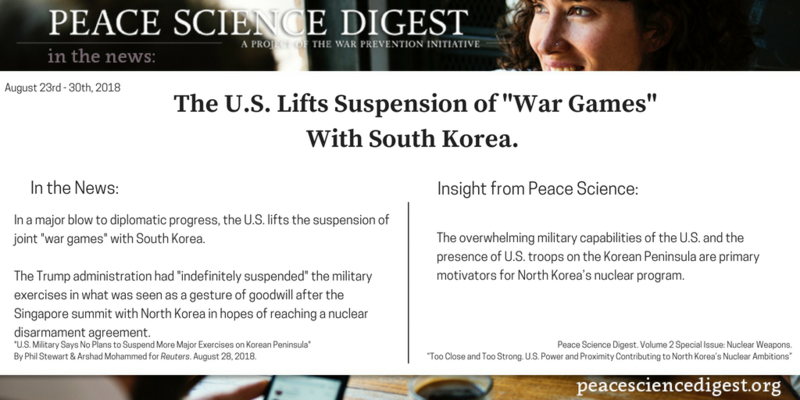 The overwhelming military capabilities of the U.S. and the presence of U.S. troops on the Korean Peninsula are primary motivators for North Korea’s nuclear program. Deployed militaries undermine national security and cause global harm. By prioritizing the vital, effective diplomatic options still on the table the U.S. and both Koreas can continue the progress towards denuclearization and a more peaceful Korean Penninsula. Recently, cooperation between North and South Korea has resulted in major social progress, as some Korean families, long-separated by conflict, have been reunited. This progress and the end-goal of nuclear disarmament is jeopardized by returning to the provocative practice of joint U.S./North Korean military exercises. “U.S. Military Says No Plans to Suspend More Major Exercises on Korean Peninsula” by Phil Stewart & Arshad Mohammed for Reuters. August 28, 2018. Peace Science Digest, Volume 2 Special Issue: Nuclear Weapons. “Too Close and Too Strong. U.S. Power and Proximity Contributing to North Korea’s Nuclear Ambitions”. Next article "Women Make Peace Stick"